File image of then-President-elect Donald Trump and Betsy DeVos. Betsy DeVos is primed to be nominated as the next secretary of education, but some California educators are not pleased with that potential reality. Roughly one thousand administrators and teachers representing the Golden State on Saturday gathered at a conference in San Jose to beg Congress to reject DeVos' nomination. That request came in the form of a petition, which urged lawmakers to protects students and their education. The fact that DeVos, who is an advocate for charter schools, has never worked at, attended or sent her own children to public schools worries Gayle Bilek, a member of the California Teachers Association Board of Directors. "She's not qualified," Bilek said. "She has had no experience in public education. We are totally against someone leading education that has no experience." 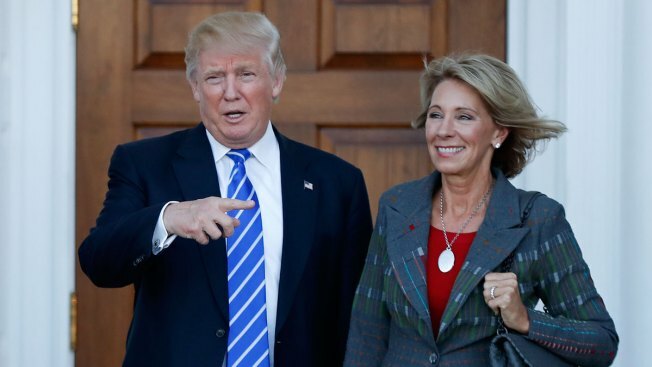 DeVos' confirmation vote could come as soon as Tuesday.